How many of you have flown in real life? I got a discovery flight as a Christmas present this year and loved every second of it. It was like being on the most awesome roller coaster ride ever. How many of you have experienced real world flying from the cockpit? Left seat once in 172SP discovery flight and many times from right seat in everything from a Mooney to a 210. Never landed though. Short final was as far as I have gone. Lessons some day I hope. My Dad was part owner of a Luscombe semi-aerobatic (load rated, but no inverted flight): High-wing, fore and aft seating, stick and rudders. Used to take me up (teenager) and have me turn, fly the horizon (i.e., level flight). Surprisingly easy to control, but maintaining altitude, etc was remarkably difficult. I guess that is the difference between flying and farting around. He used to take my brother and I rabbit hunting down in Hollister. Land on a dirt road out in the middle of absolutely NOWHERE, and at the end of the day, pick up the tail, turn her around, and off we went. I always used to wonder where a TWA pilot learned stuff like that... not to mention barrel rolls, inverted (kill the engine, point her to the ground to restart), etc. Great fun, based out of Watsonville. I had my intro flight in 2007 and started my flight training in 2008, I started in the DA-20 and moved over to the 172sp after about 5 lessons in the DA-20, with no regrets! bird, the 172sp with the g1000 (really awesome if you ask me). Started flying last year in Piper Warrior III's with Avidyne glass cockpits. Got my PPL earlier this year and just this weekend started my Multi-Rating on the Piper Seminole (What an experience it is the first time flying a twin!). So why the move to a twin? Looking at getting one? Or just a challenge to yourself. I am renting a C-172N for now, from CSB3. maybe a C-172XP soon from CYHU. I am at 307 hours, now. Yeah, it's too bad you couldn't find a job paving roads or roofing houses. Flying is such a horrible job. I can attest since it's my job as well. Well my other job is working on a ranch so I have a nice balance of the white glove corporate life and the leather glove of slapping some cows and steers and driving a combine. C-712 left side ------- Lear jet co-pilot that was amazing MA to NJ way to short best day of my life. Sat in the right seat of both a Glasair GlaStar and a Cessna 182. I was at the controls most of the flight, but the pilot did the takeoffs and landings. I've also flown on a Cessna 206, Robinson R44, and two Eurocopter AS350s as a front seat passenger. As far as airliners, I've been a typical (cabin) passenger on two Boeing 737-400s, a Bombardier CRJ-800 (800 I think? ), a Boeing 737-800, and a Boeing 757-200, but never sat in the flight deck of any of them. Started flight lessons in Civil Air Patrol back in 1986. Flew with friends in gliders and fixed wings up until 1991 when I joined the Navy. In VAQ-34 I got a chance to fly back seat from NAS Lemoore in our two seater F/A-18's. When I transferred to VFA-94 I got a the chance to fly out to the USS Lincoln (CVN-72) on an E-2. My new squadron was already on West Pac. Got out in 1994 and joined Shamrock aviation at Crystal Airport KMIC flying Cessna 152/172/182's off and on. The FBO closed so I was in limbo flying off and on when I could before I joined a flying club a few years ago at Blaine airport KANE. I haven't flown in the last two years after I bought my new house. With the price of fuel and other expenses in life flying had to take a back seat. FS9 has been a good substitute until I'm able to get back in the air which I plan to do soon. I went to Flight School at Toronto Airways from 1994 to 1996, switched to Toronto Island Airport from 1997 to 1998.....then I ran out of money to fly and haven't been back since. Good thing Flight Sim 98 came out when it did and was interesting enough to keep me going...My local airport charges way to much to fly nowadays so I will just stick with FSX. Plenty of hours in a Piper Tomahawk, a few in a Warrior and the best was an hour in BA's 737-400 full motion simulator at Heathrow. Amazing. It's my office, no 9 to 5 there. I flew KC135As for the Air Force back in Viet Nam days. Haven't flown much since I left the Air Force, but last summer, my son bought us rides on Air Combat USA. An amazing experience. We flew Macchetti SF260s with an experienced instructor in each aircraft. After some basic instruction, we passed each on opposite headings, and the fight was on! I knew what we were in for, but my son had never experienced significant g forces. He did pretty well considering all his flight experience was on a computer, but in the end, old age and treachery prevailed. We did a total of 5 aerial combats and most of the fighting was in the vertical. We were airborne for an hour and I flew all of it except for the takeoff and landing. I had a demo flight in a C172 with a local flight school. I did everything except land and take-off. 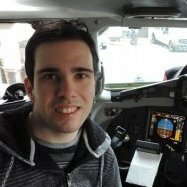 It was a lot of fun and quite interesting to compare my experiences in FSX to real flying. I just did a short flight EFMA-ESSN on Vatsim since I'm gonna fly that tomorrow. Good to be prepared especially since I can use the flightnav app I have on the iPad also when I fly on FSX!